Gaffer for a day Jack Stokes, aged 26, from Highbury, gives his pre-match thoughts on Pompey's clash against Southend. 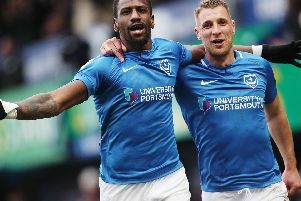 Pompey have looked really good this season – they look really industrious and able to grind out results. Last season when we didn’t play well, we’d draw or lose but now we just seem to be able to churn out wins. I’m hoping against Southend we will be more cut-throat. We’ve had a lot of one-goal wins but soon we’re going to click. We’re going to smash someone and score four or five goals sooner or later. I’m predicting a 3-1 victory against the Shrimpers. If we get Ronan Curtis and Jamal Lowe firing on all cylinders then we’ll score a lot of goals. What we want to bank on is if one is having a bad game then the other steps up and vice versa. Oli Hawkins has done really well, while Gareth Evans has been a surprise package. No-one thought he’d be as good as he has been. He has shocked everyone. He’s scoring a lot of goals and is really reliable. Evans just runs and runs and Kenny Jackett likes players like that. At the start of the season, I thought Louis Dennis would be the exact replacement for him. I thought we should just let Evans’ contract run out but we’d be silly to do that with the form he’s been in. The only change I’d make from Rochdale is Tom Naylor replacing Ben Close. A few people got on the former Burton midfielder’s back at the start of the season because of his passing but he does little bits here and there. Against Oxford, he made a superb late tackle to stop them scoring what looked a certain goal. I went to Accrington and Close started for the suspended Naylor. I like Close, he’s a good prospect but the team doesn’t seem to tick without Naylor in midfield. His passing has also got a lot better. He’s been our best signing, alongside Craig MacGillivray.